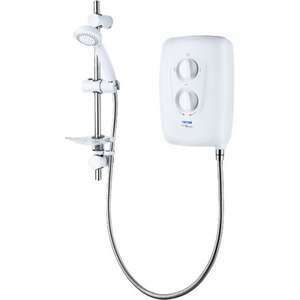 Saw this deal on plumbworld for aTriton Shower - AquaBlast Electric shower for £59.97 + delivery £6.67 = £66.94. Unfortunately I paid full price for this shower so to find it discounted i feel this is a great deal! The Triton AquaBlast Electric Shower is a desirable shower for both homeowners and professional installers alike. With a stylish elegant design, easy to install, use and clean, this shower is the obvious choice for consumers looking for a practical and stylish shower. It is also an installers dream thanks to Tritons unique Swivel-FitTM technology which accommodates water connections from the left and the right hand side of the shower, giving a total of 7 cable and 7 water enter points. The AquaBlast is accompanied with a stylish riser rail with an adjustable top end bracket to cover up any existing screw holes. With all these features combined, the Triton AquaBlast is an all round great replacement shower! My shower (Shower Force Boost) has packed up and was looking to replace it. Not sure if I would be able to install it myself. The old shower was Shower Force Boost and the company does not manufacture any now. The power to the shower comes through a transformer connected to mains fitted outside the bathroom. Decent deal but "blast" and "8.5kw" don't really go together. You won't get a powerful shower out of an 8.5kw unit! Hot deal. My shower (Shower Force Boost) has packed up and was looking to … Hot deal. My shower (Shower Force Boost) has packed up and was looking to replace it.Not sure if I would be able to install it myself. The old shower was Shower Force Boost and the company does not manufacture any now. The power to the shower comes through a transformer connected to mains fitted outside the bathroom. Sounds like a hot and cold fed shower with an onboard pump in which case something like this should be similar. That would be much better. I'm seeing flow rates of around 4 litres per minute for an 8.5kw electric. Thats terrible. good cheap shower. we had one very similar, if not the same. I was very surprised at the heat it threw out, although think it might have been 9.5kw. we only changed to a different triton due to a bathroom upgrade and for supposedly more modern looking one. Yep £50 in B&Q kings lynn, bought one last week. Also avail at screwfix. Check Tritons own website for deals. They have some good offers from time to time.